I just returned yesterday from a nice trip. I found the water murky but not as cold as I expected during this time of the year. 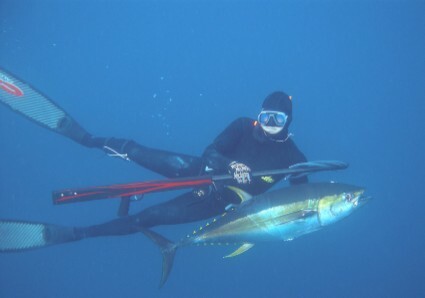 I could not find a single tuna or a single fish on my regular spots, but I attribute this to the lack of visibility and not to the lack of fish. Since tuna were chasing small sardines all over the place I decided to go chasing the birds and the tuna and was able to catch 4 nice fish, nothing big, but nice fish for the table. On my second day my large tuna gun started having problems and it kept on firing by itself on the 3rd or 6th band. One of those shots was on my chest and I couldn't breathe, I was in bad pain but managed to float while my diafragm relaxed and allowed regular breathing again. 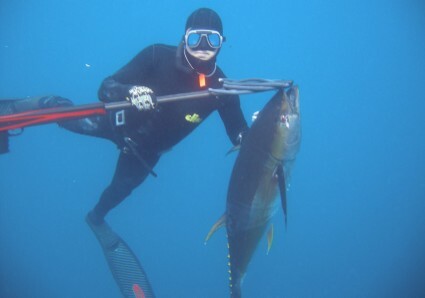 After that incident I put the speargun up and started using the Wong speargun I won at the BWO. 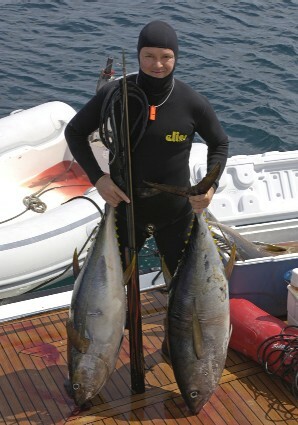 On my first dive with that gun I saw a school of tuna, but they were swimming very fast and head on. I wasn't able to aim or just pick a fish but I just waited and a dumb one came in front of me at regular speed, I aimed to the body and I just pulled the trigger. 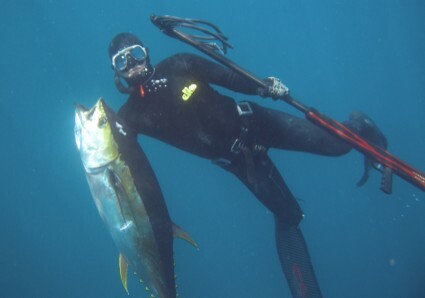 I saw the spear go straight through the tuna and just then I knew it was comming back to the boat with me. 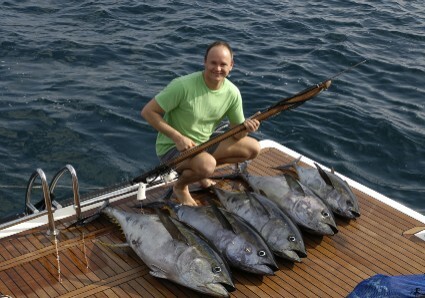 I ended up catching 3 tunas with the big gun, and then one with the new Wong. I did find what the problem was with the tuna gun, and it was the shaft, not the mech as I had thought (with Daryl's help). 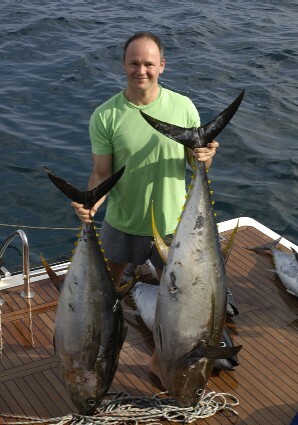 This is my first time successfully catching running tuna and it was so much fun. We would spot the birds and feeding frenzy, stop the boat 10 - 20m away from the action and just swim torwards the feast. Once close (water was murky so visibility was only 8 - 10m) I would dive and I would usually see all the tunas, most of the times they would swim past me too fast to take aim, but then usually, a strangler would come accross or just not as fast as the others and it would allow for a good shot. 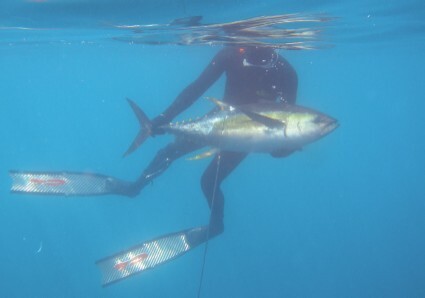 Sometimes the tuna dissapeared from where I droped and I had to swim for 100 or 200m and then dive after the sprint, so I ended up with record breath holds of about 10 seconds at 5 meters, but even with such performance I was able to land some fish. The last 2 days the water became even murkier and the tunas stopped eating in an organized way, so it was impossible to get close to them before they were gone. I tried chumming but had no luck. After lots of frustration I decided to go to shore and do some reef fishing, and took the Wong again. Visibility close to shore was eve worse, with 3m at the very best. I was diving in an area 6m deep and couldn't see the bottom, I had come accross a big school of jacks so I dove to see them circle me and then they just left. I saw another flash and dove again to see the jacks only to find a 200 - 250 Lbs tuna passing by. It took me some time to register what I was seeing and before I realized and tried aiming the gun at the fish's tail it was gone. I searched behind for other fish in the group, but it had been the only one. Hope everyone is having good diving these days, for me, it's usually the quietest time of the year as the water in the pacific turns green.